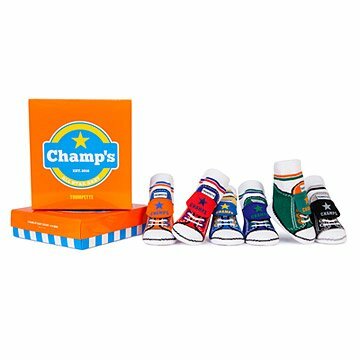 Add some sporty fun to your little one's outfit with these socks that emulate classic canvas sneakers. Add some sporty fun to your little one's outfit with these socks that emulate classic canvas sneakers. The colorful low top socks feature a stitched tongue to complete the all-star look. Packaged in a gift box. Made in Korea. Machine wash warm. Do not bleach. Tumble dry low.